Bricklink shows a price guide for two different editions of this set. What is the difference? I have the ability to buy the set, but I don't know how to tell if it is a limited edition or not. What do I look for? Limited editions were numbered 1 to 10000. They had a separately packed 1x2 tile with the number on it. The Limited Edition came with a certificate and a Limited Edition numbered sticker to put on the 1x2 plates on the front sides of the engine I believe. Limited to 10,000 units. You are right. It is a numbered plate. The box also has a yellow Limited Edition stripe on the lower right corner of the box. No box included in the deal. If I ask about the numbered plate, I am sure the price will go up. Seems like it is a buy either way. If it is a good price I sure would. 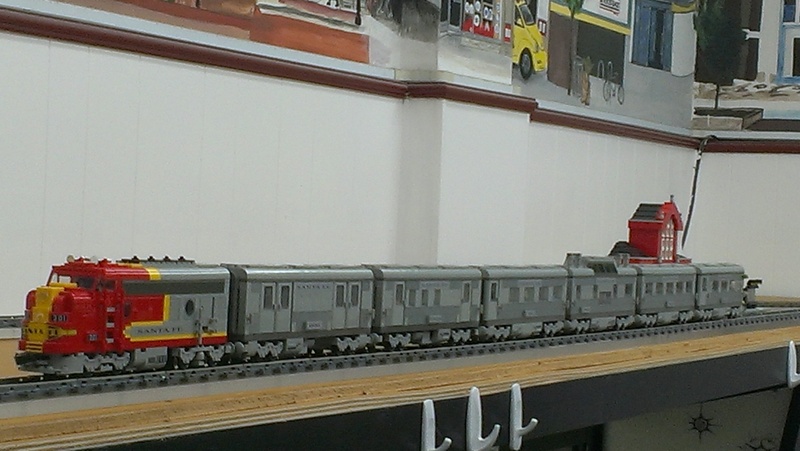 A guy in our club sold his entire Super Chief train because he needed the money. He has regretted it ever since. I won't ever sell my Super Chief. I have it and all the cars. Unfortunately, I didn't get the Limited Edition. I have 6 #10020 (limited edition) and 20 #10025 all MISB. However, I don't have any #10022, which is disappointing. Unfortunately, I didn't get the Limited Edition. @1265 are you willing to sell a #10020? My Santa Fe Super Chief set up. The cars are in order. What is missing is a B Unit (I'm currently working on). Technically I should have another A-B setup in the rear. If you notice, I have built a "Vista Dome" car. It isn't the best, but I built it back when this set came out and it probably needs to be re engineered. The only problem is that most of these parts are discontinued. The most expensive part on the Engine is the light gray porthole windows. The engine came without a 9V motor, obviously that is an expensive part :) The roof bricks are expensive too. That is if you want your train to have the exact parts/colors of that time period. Oddly the other porthole windows in the set are a fraction of the price despite being exclusive also. ^Yes, from the Coast Guard sets. They are different and more nautical compared to the ones that came with SF Super Chief. The Santa Fe Super. Chief is one of those setsthat you would pprobably be better off buying used than trying to "Bricklink" the set. The (4) Porthole windows (18) Light Gray curved roof pieces, red Windshield and sticket sheet will set you back quite a bit and that's only a fraction of all the pieces needed to complete the set. This is important. The Limited Editions came with a sealed bag of light grey "light saber" bars and red "umbrella" bars. The ones that came with the LE were dark grey. There must have been a production error and Lego fixed the problem by sending these along with the set. Sorry....I'm not in the market to sell. Does anyone know how many bags are in a new set?